Northborough – Northborough Town Administrator John Coderre gave an overview of the fiscal year 2018 (FY 2018) Capital Budget to the Board of Selectmen at their April 10 meeting. The budget includes two components: the Capital Improvement Plan (CIP) which is a six-year comprehensive plan detailing how the town replaces equipment and how it maintains its infrastructure. The Capital Budget is funding sought for any given year’s projects, in this case FY 2018. The CIP then shifts up one year then the next year’s projects become the Capital Budget. The Appropriations Committee and the Financial Planning Committee unanimously support this year’s budget. This budget will be presented to Town Meeting, Monday, April 24. Warrant Articles 21 through 33 pertain to the Capital Budget, with a price tag of $2,107,000, and consists of the General Fund and Water/Sewer Enterprise. The FY 2018 Capital Budget includes the ability to continue investment in capital equipment, infrastructure and facilities as well as the ability to link one-time revenues to one-time expenditures resulting in no additional tax impact. Items for consideration at Town Meeting include a $65,000 forestry truck; an $87,000 Police Department vehicle outfitted with mobile data terminals; a $240,000 six-wheel dump truck; a $95,000 one-ton dump truck; and a $95,000 one-ton dump with chip body and plow replacement; a $65,000 chipper; $50,000 to replace the Fisher Street Culvert; and $200,000 from free cash to replace the Crawford Street retaining wall. Article 29 involves road replacement and maintenance and will “backfill” a cut in state Chapter 90 funding which is currently at $500,000 with an additional $300,000 from free cash augmenting the Department of Public Works (DPW) operating budget of $300,000 and meets the $1.1 million needed to maintain the Pavement Management Plan. The DPW Water & Sewer Enterprise Funding requests $610,000 of funding and includes an $110,000 request for a sewer inspection camera, a one-ton service truck with plow and the rehabilitation of the West Main Street Pump Station (undersized for its current flow) at $400,000. This is the only project that will require debt servicing. 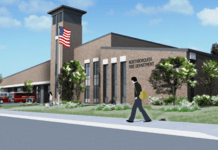 The sole Capital Budget project coming out of the School Department is the second phase of the Proctor School roof project, in the amount of $300,000. Again, this project will use funds already available. Coderre relayed that Northborough has been enjoying a favorable trend in being able to pay for capital projects with available funds. “The biggest beneficiaries of our plans are the taxpayers because we are making consistent, regular and thoughtfully planned investment in our buildings, roadways and infrastructure,” he said.